To consider types of behaviour we use to resolve conflict. To understand the principles and the value of a win/win approach. Choose one of the two activities below to highlight ways we frequently approach conflict. Question:When faced with a conflict, what are some of the specific ways we behave? Discussion:Encourage participants to give examples. Question:Are some of these behaviours more effective in dealing with conflict than others? In what ways? some solve the conflict/others increase it. Question:Why do we behave in certain ways in conflict? belief system – for me to win, someone else must lose. There are many behaviours that are appropriate for dealing with conflict. However, when we react from habit, it may mean we don’t make full use of this range of behaviours, nor do we always behave in the most appropriate way. Throughout the course, we’re going to explore behaviours and tools that are very helpful in dealing with conflict, and consider ways to make choices about appropriate behaviours so that we can respond to conflict, rather than just react in a knee-jerk manner. Question: Who is familiar with the concept of ”Fight” and ”Flight” behaviours? Question:What are some examples of ”Fight” behaviours? Question: What do you think are the main messages and intentions of ”Fight” behaviours? Often, these are labelled as aggressive behaviours. Question: What are some examples of ”Flight” behaviours? Question:What do you think are the main messages and intentions of ”Flight” behaviours? Often these are labelled as passive behaviours. The ”You” person may win or sometimes lose, but the “I” person always loses. Let’s now consider a different set of behaviours, neither “Fight” nor “Flight”. Let’s call them “Flow” behaviours. Question:What might be some examples of “Flow” behaviours? * If participants raise ”compromising” or any other behaviour which doesn’t seem to be fully a ”flow” behaviour, comment that this is a behaviour which you’d like to consider more closely later after they’ve completed the handout: ”Behaviours in Conflict”. Question:What do you think are the main messages and intentions of ”Flow” behaviours? Often these are labelled as “assertive” behaviours. Give out the handout: ”Behaviours in Conflict”. Divide into small groups of three or four participants. In your small groups, consider three or four behaviours which fit into each of these categories, and then complete the columns across the page. You may include behaviours we’ve already identified or consider others which have personal significance for you. Allow 10 minutes and move amongst the groups to assist them when necessary. Draw participants together into the large group. Question:Did any behaviours appear in more than one category? In what ways are they different in each category? A particular behaviour might appear in more than one category. To decide whether that behaviour is aggressive, passive or assertive, we need to understand the context, the relationship of the participants, the culture, what’s gone before, and what comes after. We could withdraw with the intention of punishing the other person or to ignore his/her needs and concerns. In this case, it is probably a ”fight” behaviour. We could withdraw to avoid the conflict and just keep the peace. If we did that, and felt unhappy or taken advantage of, it is probably a ”flight” behaviour. We could withdraw because we want time to consider an appropriate action. We may later return to deal directly with the issue, or we may decide to attend instead to the broader issues, to the more fundamental needs, and to the relationship. In this case, it’s probably a “flow” behaviour. Question: Did you notice any patterns for each of the categories on how people are treated in the conflict and how the issue is dealt with (i.e. the two columns on the right hand side of the handout)? During “fight” behaviour the intention which may be unconscious, is to come down hard on the issue, with little concern for the person. In ”flight” behaviour the intention, which may be unconscious, is to protect ourselves rather than deal with the problem. By not confronting, the immediate result is relatively soft on the person. During “flow” behaviour, the intention is to solve the issue whilst respecting everyone in the conflict. Although, “flow” behaviours seem to have the best outcomes, we often resort to ”fight” and ”flight” behaviours. And, indeed, they are unlikely to be dismissed completely from our repertoire. However, all the conflict resolution skills covered in this course can be used as part of a ”flow” or win/win approach. Give out the handouts: “Fight, Flight, Flow: Some Behaviours“. Let’s explore what a win/win approach is about, by listening to a story. There are two sisters in a kitchen and only one orange. Both of them want the orange. What could they do? When someone says compromise or ”cut it in half”, continue the story. That’s what they did. One sister went to the juicer and started to squeeze herself a drink which turned out too small to satisfy. She then threw out the rind. The other sister, with some difficulty, began to grate the rind of her half of the orange to flavour a cake. She then threw out the juicy pulp. They both had only half an orange when, in effect, they could have had the whole orange. Question:What could they have done in order for both of them to have the whole orange? found out what each other wanted/needed. The key to a win/win approach is to explore needs before settling on a solution. In the orange story, the sisters compromised. 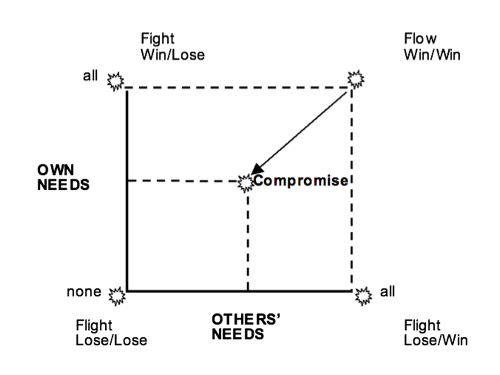 Question:Compromise is sometimes considered the same as a Win/Win approach. What is compromise about? Why do we so frequently compromise? What are its advantages? It may seem the simplest, easiest and fairest thing to do. It means that when we can’t make a bigger pie, at least, everyone is sharing in what is available. It results in both parties having some of their needs met. Question:What are some of the disadvantages of compromise? It often requires one party to give more and then they will be less committed to the solution. It may mean that the potential of all options hasn’t been explored. It may breed resentment within the relationship. Although compromise has disadvantages, it is sometimes a valuable approach. However, if we settle too quickly for compromise, we can sell ourselves short. It may be that we decide on a poorer quality solution than we would have if we had adopted a win/win approach. The horizontal axis represents how much of others’ needs are being met. A win/win approach starts by looking for solutions that meet all needs (point to the market Win/Win) and moves backwards, gradually and only as far as necessary, towards compromise, to come up with a solution that meets as many needs as possible. (Draw attention to how much more of the axes are now covered by the win/win. Draw in the diagonal arrow to show the gradual movement ‘backwards”.) lt’s far more likely to be a good quality solution than that chosen from a quick compromise. would occur somewhere along, or near, the diagonal arrow, preferably close to the top. will not always happen. Sometimes, an outcome will be chosen which meets few needs or favours one person more than another, particularly if some participants are unwilling to negotiate. A win/win approach is always an option. Question:What do you think are the basic principles of a win/win approach? consulting with others to explore needs and to consider all possible options. This increases the likelihood of reaching a solution which addresses more of everyone’s needs and to which everyone will be more committed. Giving and taking, when we know we have been heard and considered, feels very different to compromising immediately. Question: Why use a win/win approach? What are the benefits? focuses people’s energy and attention on solving problems rather than fighting with each other. It can be valuable, although not essential, to leave time (e.g. a day or a week) between doing section D and Section E. This gives participants a chance to absorb the material from Section D. As well it is possible to ask them to think about situations for which win/win seems impossible, to be discussed at the next session. Question:Think of a conflict for which a win/win approach doesn’t seem to be possible. What is it? List participants’ responses on the board. (Have a few sample situations that you can add to the list.) e.g. two family functions on at the same time: one in the city, one in the country. Question:Does win/win still seem impossible? What do you think can be done with these difficult situations? Discussion:Encourage participants to share strategies they’ve considered so far. Give out the handout: ”Key Features of The Win/Win Approach”. Highlight points that may be particularly appropriate for participants’ difficult situations. Ask participants to consider again the situations they’ve identified on the handout. Are some of these points (i.e. those on the handout: ”Key Features of The Win/Win Approach”) relevant for developing a win/win in your situation? Discussion:Ask participants to share any points which they found particularly helpful. Different types of behaviour are appropriate in different situations. Mostly, we will be very practised in using two or three behaviours, and may feel less comfortable with the others. The more flexible we can become, the more choices we have about how we relate to others, and the more opportunities we have to resolve conflict. For the win/win approach to become our first choice, we need to develop new skills. We need to learn to step back from solutions, to considerate need or concern driving each person to particular outcomes. How has the solution been generated? Have all needs been considered, all options been explored and the solution been chosen which meets more major needs than any other? Have the relevant parties participated in the process? Aim:To show how frequently the concept of winning is tied to the idea of someone else losing and how this influences our approach to a task. Instructions:Give no background concepts before playing the game. We’re going to do an exercise to get us started. Ask each participant to choose a partner roughly the same size as him or herself. Then ask for a volunteer to demonstrate with the trainer. 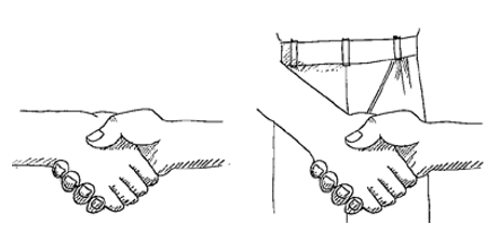 The trainer and the volunteer stand facing each other and take a handshake hold. The aim of this exercise is to win as many points as you can. You score a point every time you get the other person’s hand to your hip. The trainer and a volunteer demonstrate what “getting the other person’s hand to your hip” means but do not engage in a struggle in front of the group. The exercise is set up in as neutral a way as possible, so that people will project onto the instructions their natural inclination. Be sure to keep count of your points. Allow between 30 seconds and 1 minute. Discussion:What we’re going to do is to explore the differences in the number of points people achieved, and how they did it. Who scored more than 50? Less than 10? How did you do it? How did you interpret ”you” in the instructions – as an individual, a pair, a group? Did the idea of “winning” imply ”losing” as well? For someone to win, did another have to lose? Who discussed it with their partner? What was discussed? Who changed strategy during the exercise? Why? In conflict, are there times when we use the same approach as we did in the exercise? Are there other occasions when we use a different approach? ln an exercise such as this, it is possible to interpret ”win” in a variety of ways, and to behave accordingly. Problems arise when we transfer a concept of ”winning over” – to situations where ”winning with” – would be more beneficial. ”Winning over” is about one person winning while the other loses. ”Winning with” is about co-operating so that both people obtain what they want or need. As well, we frequently behave in certain ways out of habit, rather than from choice. This means that we lose flexibility in our approach to conflict. Aim:To show how frequently the concept of winning is tied to the idea of someone else losing and how this influences the style with which we approach conflict. Have the group choose partners, and sit opposite each other with about an inch between the knees, or across a small table, if available. Ask participants to think of three things that they really want e.g. a job promotion, an overseas holiday, a new car. They don’t have to share this information with their partners. The object of the exercise is to have all your wishes granted. When Partner A gets Partner B’s hand down to the level of B’s knee (or table, if used) Partner A has one wish granted and vice versa. The trainer demonstrates how to do this by assuming an arm wrestle position. The exercise is set up in as neutral a way as possible, so that people will project onto the instructions their natural inclination. Therefore, do not describe verbally the arm wrestle position or label it as such, or enter into a mock struggle while demonstrating. 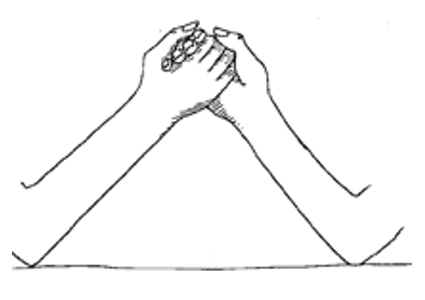 Ask participants to take hold of their partners’ hands, as demonstrated. Discussion: Who had all their wishes granted? How many of you, upon hearing the instructions ”have all your wishes granted” thought there had to be a winner and a loser, that it was a competition? Who discussed it with their partner? What was discussed? Who changed strategy during the exercise? Why? 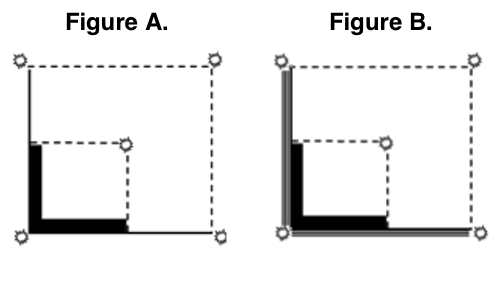 In an exercise such as this it is possible to interpret ”win” in a variety of ways, and to behave accordingly. Problems arise when we transfer a concept of ”winning over” to situations where ”winning with” would be more beneficial. As well, we frequently behave in certain ways from habit rather than from choice. This means that we lose flexibility in our approach to conflict. Control, demand. Submit to another’s power. Share power or work towards it. Punish, reward. Resign to the situation. Unfold the opportunity. to refuse to deal with other’s needs and concerns. Withdraw to consider needs and concerns of self and others. Return to address the issue as appropriate. Explode, dumping responsibility on the other person and denying ownership of any part of the problem. Suppress at least to the other person, the distress felt. Contain discomfort carefully, if you choose now to deal with it at a more appropriate time. Manipulate while appearing to compromise. hasty compromise. Seek agreement which is fair to all involved. Sometimes a win/win outcome seems impossible. However, applying a win/win approach explores the possibilities in the situation. It may result in unexpected outcomes. Why does win/win seem impossible? How can the obstacles be removed? Can a win be redefined? What can rebalance a loss? What’s the long term perspective? Win/Win solutions are not always possible. What are the long-term and short-term consequences of win/lose? What are the advantages of win/win? Identify many options and develop the ones that give everyone more of what they need. Re-define what constitutes a win. Take a long term view. STRENGTHEN YOUR OWN APPROACH RATHER THAN WEAKENING THEIRS. The Win/Win Approach by Conflict Resolution Network is licensed under a Creative Commons Attribution-NonCommercial 4.0 International License, except where otherwise noted.